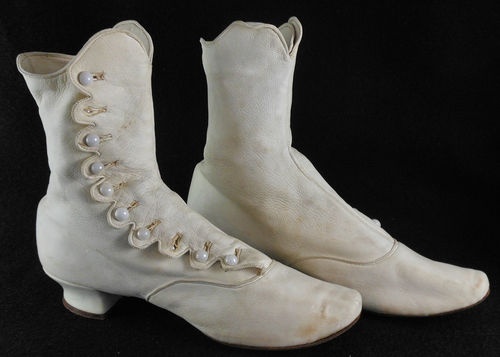 It's been forever and a day that we've been working on these two mid-19th century shoes, but finally I have "Renoir" button boots, and "Tissot" slippers for you! Both styles are accurate for the late 1850s to the 1880s. Both are developed directly from originals in my collection, and we've spent oodles of time shaping the heels, toes, and silhouettes of these two lovelies, to produce the prettiest little Victorian shoes we could. The original for "Renoir" was actually a cotton side-buttoning boot in an ivory color with white buttons. We decided to go with dyeable leather for practicality, but used the original boot's pattern and heel to work from in developing a wearable, comfortable version. 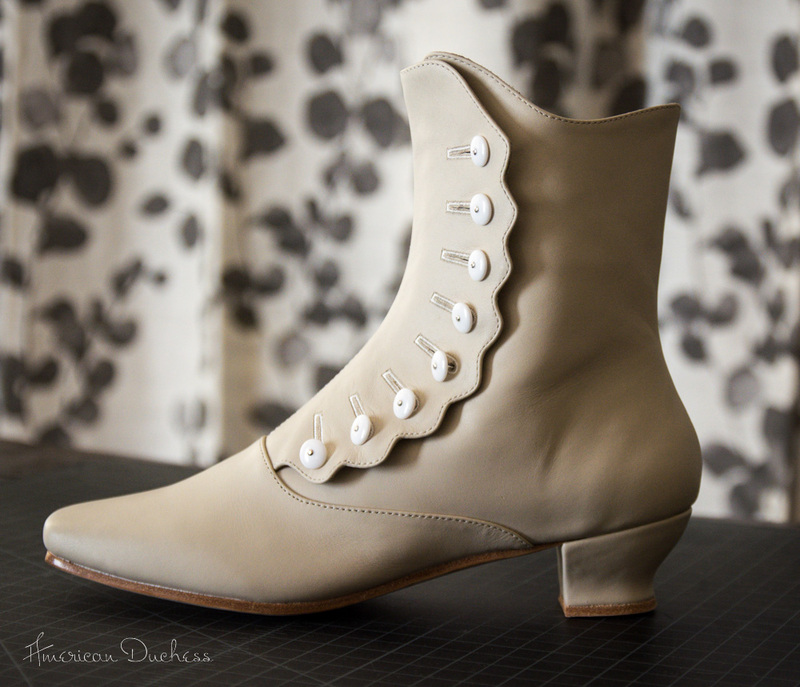 Like Tavistock, the Renoir boots are button-only, and require a buttonhook to easily close. 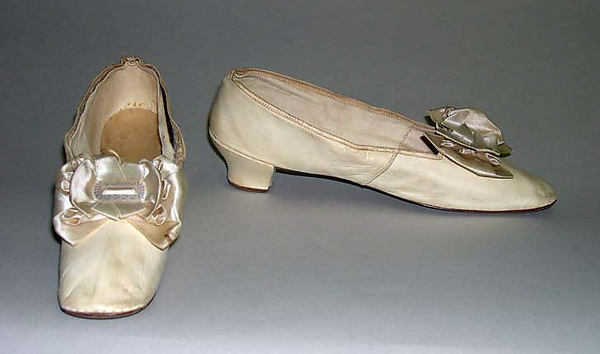 Like originals from this period, they have square toes lacking toe boxes/counters, which creates that unique mid-Vic shape. The Renoirs do *not* have an elastic gusset on the inside, and with a 6" shank, will fit above the ankle but below the calf muscle. 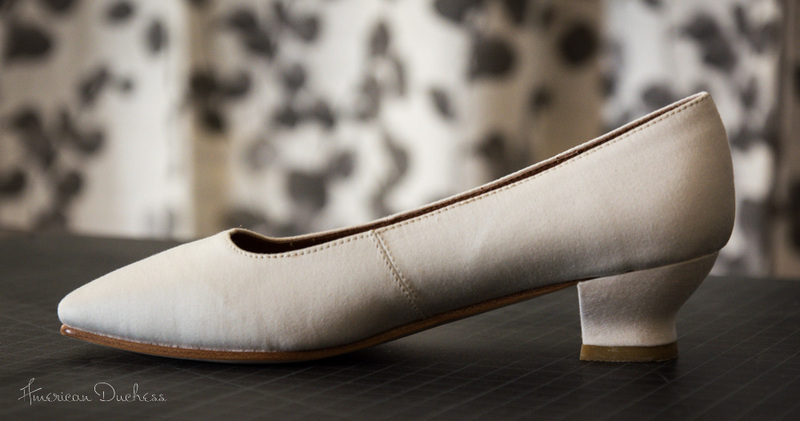 The buttons are individually attached, so you can easily move them to fit your ankles perfectly. These little slippers are highly customizable with dyes and myriad shoe clip designs. The original shoes were a paper-thin kid leather with rosettes on the vamp. We've re-created the style in a wonderfully dyeable cotton designed to mimic kid (this was done in the period as well). 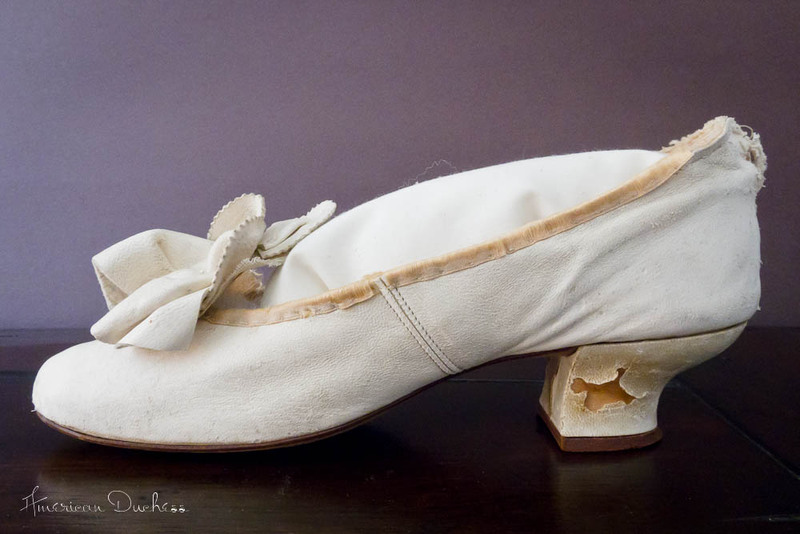 The lining and sole are leather, the toe square, and the heel that iconic mid-19th-century "opera" heel molded from the original shoe. The pre-order for *both* of these styles will start Monday, April 7th, 2014. As always, we have to meet a minimum to make these two happen, so please consider pre-ordering, and helping to spread the word to other ladies who may be interested. You'll find both Renoir and Tissot at AmericanDuchess.com on April 7th! wow they are so beautiful!! absolutely in love with the renoir button boots. This is great. I love your shoes. And now more styles to pick from. 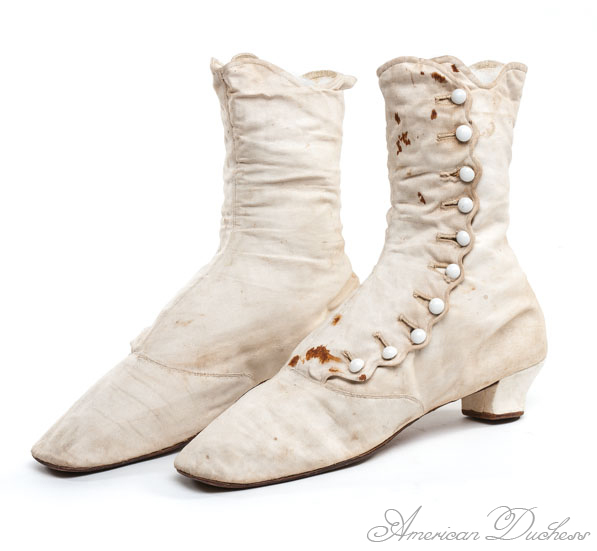 Love the renoir button boots, but, I don't think I could wear them with my wide ankles. Hi Fixit - the ankle circumference is about 10" (inside measurement), but the button overlap is about 1.5", so if you needed to adjust the buttons (like they did in the period), you could fit up to an 11.5" ankle. Hope that helps! So excited these are finally going to be available! Especially the Renoir boot! Please tell me you're getting size 11. Hi Glennis - yes, we'll have size 11!